An average adult person spends more time at work than anywhere else. A recent survey shows that close to 50% of employees in the U.S. think their office environment is the essential element of job satisfaction. Unfortunately, office space planning is often considered unimportant, or less important than many other aspects of running a business. Proper office layouts not only improve collaboration and productivity between teammates, but also affect a company’s bottom line, by boosting employee productivity. Let’s look into workspace planning that focuses on efficiency. Space planners should strive to consider the required technology and equipment for each space. Space planning with technology on mind doesn’t necessarily mean encrusting the space with technology or equipment that is to go obsolete in a matter of years. As an example, in the past, many work desks were planned around available phone jacks, but nowadays many workers use mobile phones for their daily communication. One thing is certain, when discussing technology in the context of interior design and space planning, someone from IT needs to be at the table. While many employees find it hard to get accustomed to a change, it’s important to keep them motivated while promoting the newly designed space. As you maintain an enthusiastic attitude and share your excitement, getting feedback from everyone involved also helps as well as remaining approachable during the process. A company meeting or two is also recommended, as you get a chance to discuss the changes and get everyone excited about the new arrangement. Each business environment has its own individual storage requirements. An accounting firm will have different needs from that of a dental office, but in both cases, contemporary office storage solutions are a crucial part of the workflow and a critical part in the space planning. From temperature-controlled storage options to secure storage in the financial sector, incorporating adequate storage is essential in any successful design. It’s important to consider all storage needs at the beginning of the space planning project, as leaving it until the end can create a shortage of available space. In addition, space planners should take into account detailed wants, needs, and requirements for each space in the office. 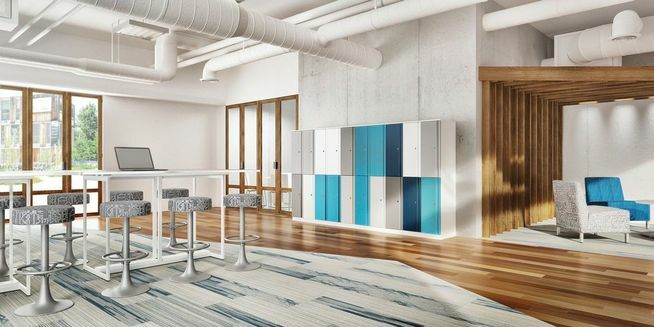 Not only will a well-designed space feel natural to the occupants, but will also adapt to the need of employees, instead of forcing them to adapt to the change. If the nature of the business is highly collaborative, for instance, the offices most likely need open spaces for employees to congregate and work together. In this case, designing an office space with cubicles might not be the best strategy. A solid space plan takes into account the company’s daily activities as well as deals with issues such as the arrangement of departments, interaction of employees within each department, etc. For example, if your marketing department regularly interacts with sales, these two departments have no business being on the opposite sides of the building. What’s more important, considering these cases in advance guarantees a layout that works toward greater productivity and efficiency. You also might want to look into boosting cosiness, as this often helps employees unleash their creative potentials. Regardless of the final design, every office needs room for company growth. Anticipating the future outlook and the rate at which the growth will happen could be difficult, but it’s relatively easy to estimate if the company will need to accommodate more employees in the future and where they will be placed. Using the available space more efficiently is usually a motivator for start-ups who need to reduce costs, and planning for growth in advance can help the layout change as the company grows. Apart from the need to use space more efficiently, altering an office layout is a great way to increase flexibility among workers, attracting and retaining talent, and supporting cultural changes, such as welcoming millennial workforce into the office.